While 99.98 percent of British Virgin Islanders are hunkered down in their homes during Hurricanes and Tropical Storms, Captain Algernon “Allie” Chalwell has no idea what happens on land during a Hurricane. For the last 28 years, Chalwell has been riding out Hurricanes at sea, starting with Hugo. Chalwell, who first sailed to Puerto Rico on his own at 14 with a note from his father for immigration because he couldn’t make it, said because a Hurricane is a dangerous storm, as boat owners with big boats, they have to go away from the storm. 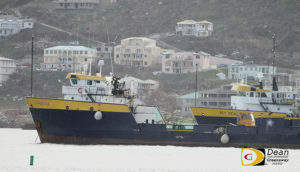 Staying in the BVI he said, they’d lose their boat and their business. Chalwell who manages the family business Star Shipping, was on Sky Seal while his brother Cleave was captain on Pacific Seal. For Maria which was coming on the south, he said they went 75 miles north of Anegada. During Maria Cleave said his mast on the Pacific Seal, a 165 foot long vessel broke and his ramp came off. Chalwell, from a line of East End sailors including Grandfather Milford Chalwell, sailed with his father Kenneth who was in charge during Hugo. He said no one expected Hugo to be as massive as it was at the time. They decided to anchor in the East End harbor until the storm passed. He said they had three anchors and as it started getting bad during the course of the night, the boat started dragging the anchors. When battling a storm, Chalwell said if you lose power, you’ll lose control of the ship. He said just as in a vehicle, if you’re coming down a hill and it stops you can’t control it. Cleave, a captain for 15 years, added that you have to know what you’re doing or you will lose your life. Cleave said his crew had never experienced a hurricane and they kept coming on the bridge and asking if everything was going to be okay. At one time he went to the engine room and everyone was strapped with a life jacket.